I’m Dying Up Here on Showtime: Cancelled or Renewed for Season Three? How long will the good times continue at Goldie’s? Has the I’m Dying Up Here TV show been cancelled or renewed for a third season on Showtime? 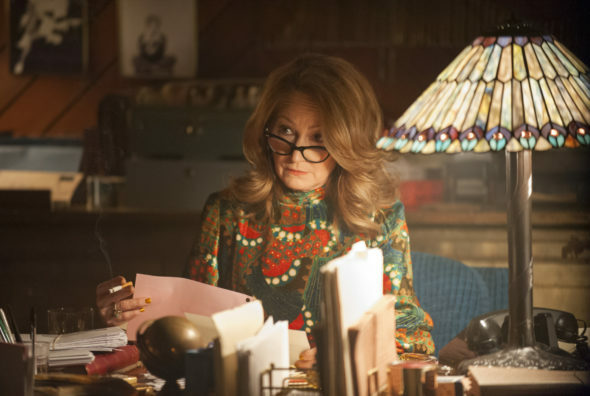 The television vulture is watching all the latest cancellation and renewal news, so this page is the place to track the status of I’m Dying Up Here, season three. Bookmark it, or subscribe for the latest updates. Remember, the television vulture is watching your shows. Are you? A Showtime comedy-drama, I’m Dying Up Here stars Melissa Leo, Ari Graynor, Michael Angarano, Clark Duke, Andrew Santino, Erik Griffin, RJ Cyler, Al Madrigal, and Jon Daly. The story centers on the regular performers at Goldie’s comedy club, owned by Goldie Herschlag (Leo). She is as tough as it takes to be successful in this business, for the sake of her club and her comedians. While the first season focused on landing a big gig like Carson, season two explores what comes next. The second season of I’m Dying Up Here averaged a 0.04 rating in the 18-49 demographic and 178,000 viewers. Compared to season one, that’s down by 3% in the demo and up by 24% in viewers. Learn how I’m Dying Up Here stacks up against the other Showtime TV shows. I’m Dying Up Here has been cancelled so there won’t be a third season. Could it be revived some day? Stay tuned for further updates. Will Showtime cancel or renew I’m Dying Up Here for season three? It’s been doing better in the ratings and Jim Carrey is one of the producers so I think it will score a third season renewal. I’ll update this page with breaking developments. Subscribe for free I’m Dying Up Here cancellation and renewal alerts. 9/30/18 update: Showtime has cancelled the I’m Dying Up Here series. Details here. TV show ratings are still important. Follow I’m Dying Up Here‘s weekly ups and downs. Find more I’m Dying Up Here TV series news or other Showtime TV show news. What do you think? Do you hope the I’m Dying Up Here TV show will be renewed for season three? How would you feel if Showtime cancelled this TV series, instead? More about: I'm Dying Up Here, I'm Dying Up Here: canceled or renewed?, I'm Dying Up Here: ratings, Showtime TV shows: canceled or renewed? The Chi: Is the Showtime TV Series Cancelled or Renewed for Season Two? SMILF: Is the Showtime TV Series Cancelled or Renewed for Season Two? Patrick Melrose: Has the Showtime TV Series Been Cancelled or Renewed for Season Two? Dice: Is the Showtime TV Series Cancelled or Renewed for Season Three? I’m Dying Up Here: Cancelled or Renewed for Season Two on Showtime? Ill Behaviour: Is the Showtime TV Series Cancelled or Renewed for Season Two? Guerrilla: Cancelled or Renewed for Season Two on Showtime? Please renew this show. One of the best shows on the air. I’m Dying Up Here has an excellent ensemble, compelling character arcs, and relevant story lines. I can’t wait to watch it each week. It would be such a shame to cancel it! I’m baffled as to why it doesn’t get any Emmy love. I hope that the writer’s, cast and crew know what an impact they are making! Yes, to everything you said! So hoping something takes a chance on another season! Such a great show that people are missing out on!